Conflict that causes litigation can have a seriously damaging effect on your organisation. Win or lose, if litigation becomes long and drawn-out, it can rob you of your time, energy and resources. So it is vitally important that owners, partners, directors and managers (‘managers’) who want to run their business well recognise the danger posed by conflict that leads to litigation and work to avoid it. 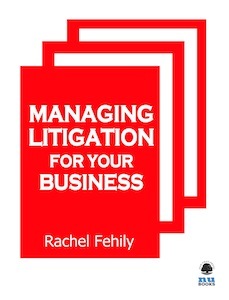 Rachel Fehily’s book, MANAGING LITIGATION IN BUSINESS, was published in June. It details the steps a business can take to minimise conflict and how best to deal with the litigation process. Most litigators suffer frustration on seeing clients enduring the agonies of costly litigation, compounded when the lawyer representing the other side is obstructive or, worse, less than competent. Good litigators will always try to achieve the best outcome for their clients. This inexpensive e-book, by a prolific writer, barrister and mediator, has much to commend it, as it provides practical advice to businesses on how to avoid unnecessary litigation, such as defusing situations where litigation is threatened, effective use of ADR, hiring the right lawyer, and instructing a lawyer to resolve potential litigation by negotiation in a timely and cost-effective manner. When litigation is unavoidable, it discusses how to run a case effectively and control legal costs. It is written in a straightforward style, which will engage the busy business manager. Far from being a lawyer-bashing tome, it advises on how to engage with lawyers, drawing attention to the many principled lawyers (as well as to the thankfully rare, less scrupulous ones). Should lawyers read this guide? Certainly; it contains a few nuggets of wisdom that will interest the experienced litigator (for example, on seating positions at meetings and how not to look bored or disbelieving!) For less experienced lawyers, it includes many truism that lawyers constantly impart to clients, so it provides an accelerated learning opportunity. It is worth adding to a solicitor’s collection, if only to pass to a client who needs some encouragement. This is a handy law primer for businesses worried about the threat of litigation. Published in e-book format, it ranges over a wide area including defusing situations where litigation is threatened, use of alternative dispute resolution (ADR), instructing your lawyer to resolve potential litigation by negotiation, running cases effectively and dealing with post-litigation issues. Conflict that causes litigation can have a seriously damaging effect on your organisation. Win or lose, if litigation becomes long and drawn out, it can rob you of your time, energy and resources, according to the author. If litigation is unavoidable, then managers also must learn to deal with it effectively, because if it is allowed to become out of control and acrimonious, it can badly affect your organisations’ relationships and reputation – and even may cause its destruction. Author Fehily is a qualified barrister and runs a consultation and mediation practice that provides a mediation service and strategic advice to individuals and businesses who want to resolve their disputes amicably. Conflict resolution features widely in the book.